Tallahassee, FL – (October 24, 2018) “I get to see what I used to look like, what I can be like, and what I want to be like, all in the same place,” said ARC graduate and canteen crew member, Clint Bross. After earning a second chance at life through The Salvation Adult Rehabilitation Center (ARC), Clint is now serving on the frontlines of The Salvation’s Army’s disaster relief operation in Tallahassee, FL. After serving his country in the U.S. Airforce, Clint struggled with drug and alcohol addiction for several years. By 2011, Clint entered The Salvation Army’s Adult Rehabilitation Center (ARC) in Fort Lauderdale, where he not only started living a life of sobriety, but also revived his relationship with God. “I did [other sobriety fellowship programs] but you can only hear so many horror stories. I don’t want to hear horror stories. I wanted to hear positive stories and that’s what the Bible is all about. I started reading it every day at the ARC,” said Clint. Upon completing the program, Clint became a truck driver for The Salvation Army of Fort Lauderdale, where he gets to transport the very donations that supports the rehabilitation program he graduated from. Michael, Clint simultaneously celebrated his seven-year sobriety anniversary. “I celebrated seven years of sobriety by giving back and that’s awesome. I went from drinking and smoking to standing here, handing out plates…smiling, and giving hope to other people,” said Clint. In Tallahassee, Clint is currently serving alongside his crew member T.J. Recchione, who also graduated from The Salvation Army’s ARC program in Fort Lauderdale, just two days ago. “It feels great to be able to help people. 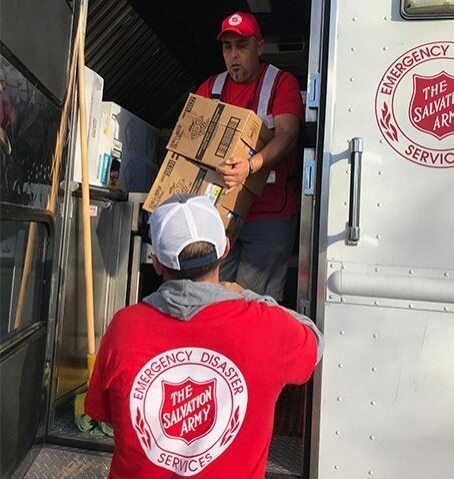 It feels great to see the gratitude from these people that have that lost so much,” said T.J.
From adult rehabilitation programs to disaster relief services, The Salvation Army is committed to meeting the greatest need. To help support the disaster relief work of The Salvation Army, donations can be made at www.helpsalvationarmy.org, by calling 1-800-SAL-ARMY, by texting STORM to 51555, or by check (designated “2018 Hurricane Season – Michael”) mailed to PO Box 1959, Atlanta, GA 30301.